*The City Light Orchestra, arguably the most successful Kansas City-based jazz group of the last quarter century, will reunite for a "KC Jazz Brunch" Sunday, October 14, at the Athenaeum, 900 East Linwood. Alaadeen, David Basse, Joe Cartwright, Jason Goudeau, Jack Lightfoot, Chris Burnett, Will Matthews and Tyrone Clark are scheduled to participate. *Our friend Lee gets busy with jazz on KCUR, commentary and notes on Kansas City artists. *The Star's Steve Paul wrote a front-page feature about Megan Birdsall's ailment. *Tim Finn conducted an interesting interview with Karrin Allyson. Stop by the bank on your way to her show tonight- tickets to the benefit are $175. *Joe Klopus' weekly column focused on organist Melvin Rhyne. *Steve Penn offers final thoughts on the American Jazz Museum's anniversary celebration. *The Village Voice reports on an infiltration in New York of "a tribe of KC bohemians" including Plastic Sax faves Dirty Force. A companion told me that Kerry Strayer seemed annoyed when I raised my camera to photograph him Sunday during his performance at the Plaza Art Fair. (EDIT: Strayer has since informed me that "nothing could be further from the truth.") Even if true, that won't prevent me from praising the saxophonist's impeccable sound and exquisite taste. His versatility affords him many of Kansas City's most coveted jazz gigs, including a show with his "orchestra" tonight at the Blue Room. Vocalist and trombonist Earlie Braggs, who was slated to host a CD release party later that day at Jardine's, sat in with Strayer's outstanding band. *A local artist made an excellent video that captures the spirit of the American Jazz Museum's "Street Festival" last weekend. It's above. Even though I stood right next to this guy a couple times, I don't make any accidental cameo appearances. His editing skills are commendable. Note that the R&B cover band he identifies as Event is actually Karma. *Here's the Star's review of the event. *The Star's Steve Penn addresses progress at 18th & Vine. He touches on related subjects here. Blogger impresario Tony is not a fan. *The politics of jazz in Kansas City can be unpleasant. *Joe Klopus considers the American Jazz Museum's future. He quotes museum director Gregory Carroll, who also offers his perspective here. *I'd like to know more about this Jay McShann film project. *Lawrence.com offers a Snuff Jazz podcast. *The Boulevard Big Band has a new release. *Guitarist Danny Embrey gets a little attention here. There are a few unwritten laws for residents of the Kansas City area. Rooting for the Chiefs isn't optional. A firm preference for Gates or Bryant's must be established. And attendance at the Plaza Art Fair is mandatory. *It doesn't bother me that the two biggest draws at this weekend's "Turning X on 18th & Vine" celebration aren't jazz artists. I've always loved randy funksters Cameo, and Patti LaBelle's presence is probably the reason Friday's high-dollar fundraiser is sold out. Here are listings of events on Thursday, Friday and Saturday. The "Street Festival" on Saturday looks especially promising. *Details on Kansas City's new sister city relationship with New Orleans are here. *Surely the late Joe Zawinul played here a few times, but I don't recall seeing him perform in Kansas City. Here's one definitive Kansas City connection- Zawinul backed Eddie "Cleanhead" Vinson on this album when he was in Cannonball Adderley's band. *Joe Klopus previewed Arch Martin's last gig in KC for the Star. *Here's Lee terrific audio of the recent ceremony at Bird's grave. It's the single best report from the event. *Steve Paul's photos from of the recent Charlie Parker tribute are here . *The second part of NPR's podcast on Charlie Parker is now available. *A local woman was the inspiration for the composition "Dream a Little Dream of Me". *Why mention Barry Manilow in this space? He's releasing a jazz-oriented Christmas album through Kansas City-based Hallmark. Details are here. 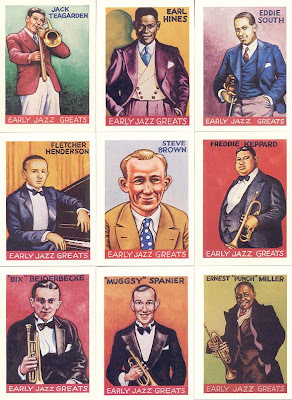 *The Kansas State alumni magazine published a charming history of the university's jazz band. According to a press release submitted to the Kansas City Star last week, Megan Birdsall has been diagnosed with a devastating medical condition. The chanteuse is reportedly "in extreme pain most of the time, and if left unchecked, her condition will continue to deteriorate to the point that singing and eating would be completely impossible." The press release also promotes an October 17 Birdsall benefit at Jardine's. As Plastic Sax wrote here and as demonstrated in the video featured above, Birdsall is one of Kansas City's most exciting and engaging talents. *I began frequenting the Phoenix in the '80s in part because the jazz club afforded me the opportunity to rub shoulders with Speedy Huggins and the Scamps. That history makes this development especially difficult. Both Plastic Sax and Hearne Christopher have been reporting that the Phoenix has been dark for weeks. Their web site now confirms it. *The great untold story in Kansas City music is the tragic saga of Gregory Hickman-Williams. It looks like Lee plans to spread the word. *NPR produced a fine podcast about Charlie Parker. *The Star's Joe Klopus profiled Chris Burnett. *Star columnist Steve Penn wrote a positive account of the local jazz scene. In another column, he tells the story of Loren Pickford. *The savvy jazz-oriented acts performing at the Crossroads Music Fest include the Scamps, Mike Dillon and Malachy Papers. *Here's a newly uploaded Snuff Jazz video. *Here's a lengthy blog post about a night at the Blue Room.